Somewhat based on the recent movie release, Battleship is a first person shooter that allows you to do everything a shooter includes while being able to fight on the sea via the Battleships. 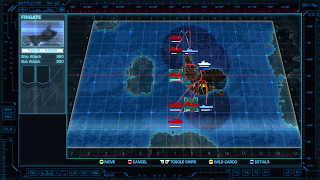 It’s an interesting mix of the FPS with turn based mechanics; however does Battleship win the war? Or does it meet its end no matter where it goes? The game begins with the Battleships, which are running patrols on the sea until an abnormal reading appears on their radar. This reading appears to be an object heading to earth and from the cutscene, the object are alien ships crash landing into the Pacific Ocean. These aliens look to regroup and take over earth as their new home however EOD Officer Cole Mathis has something else to say about it. While disarming left off mines on Necker Island, he and his team come under attack from the invaders. 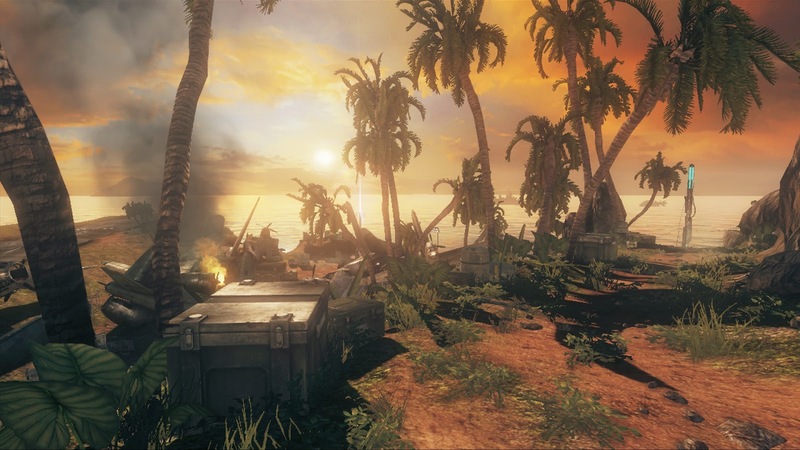 After hearing from headquarters about the aliens and their current plans to begin with the islands in the Hawaii Archipelago, Cole Mathis moves from island to island, destroying the aliens on both that land and the Ocean surrounding it. While some sense of a narrative is there, none of it is really dived into during the game but instead is replaced with really dry objectives that don’t immerse the player. The short cutscenes in-between missions give brief info on what’s currently happening, however even that is more like an objective update and doesn’t fully contribute to the overall plot. The basis of the game is to clear out the alien forces from each island you go to. This includes defeating them on both the land and the sea. At the beginning you only have to deal with the invaders on the island however as you go along, you gain access to a computer which allows you to control the Battleships on the sea. On land, the gameplay is a complete FPS where you and your team (actually it’s just you) advance through the waves of aliens and reach the end point. Along the way, objectives may pop up such as disarming bombs or taking down generators to access another area. While some of these objectives do add some sort of a challenge, they in a sense feel completely rushed and instead of giving each one some actual purpose, it feels like it was just thrown in there. On the sea, everything is played using the Battleships in a turn based style. From land you are given access to a computer which allows you to control the ships, this is called Battle Command Control and works as a sort of menu in which you can set up their positions and next target. You can also pick up wild cards which allow you to power up the Battleships, giving them stronger missiles, better defence or the one that seems to be the most useful, Ship Control which gives you full control of one vessel and all of its weapons. This in turn switches the gameplay to a sort of one on one between your ship and the enemy’s in which you can hit it with everything you have. This is really useful especially if your ship is high on damage as Ship Control grants you a 200% increase in attack. I think one of the biggest problems that Battleship has is the idea of blending two different types of gameplay together. One is more adrenaline fuelled while the other requires more strategy and thinking, requiring you to switch between the two adds a sort of block in which the gameplay you were currently experiencing is completely killed and you’re instead required to re adapt and focus on another area. I was also really surprised at the lack of a Multiplayer as it’s something that has become a standard for games in its genre. 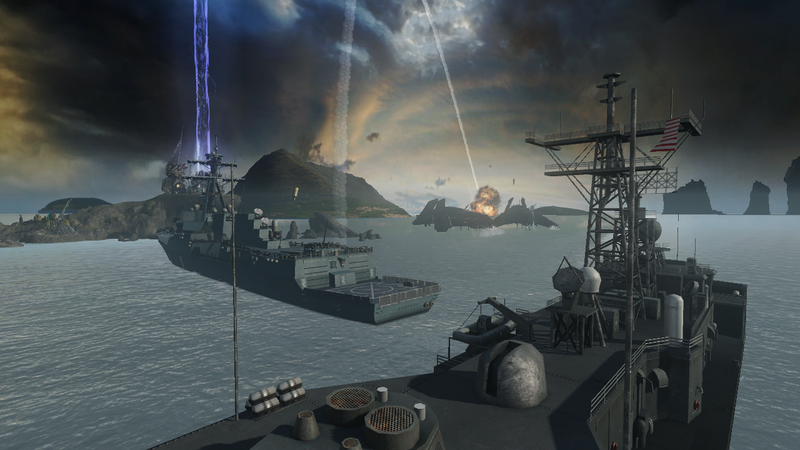 Visually, Battleship looks like every other FPS out there that aims to be realistic to the eye. Environmentally the textures look sharp and the lighting looks to be pretty well done however I feel as if I’m staring at the same thing no matter which island I seem to be fighting on. The only time you get to fight on the sea is during the use of Ship Control and the water there looks great. The way that the ship moves over the waves looks really refined and the presentation there really seems to put you into the action. Enemies look dull and their designs could have been a whole lot better, right now they look like humans with special armour on and I feel as if they could have gone crazy on the whole outer space - Sci-fi idea. Great environments but... haven't I been here before? Background music fits well with the invasion/under attack theme. During standard exploration it seems to follow a normal yet slightly sped up heartbeat but once the action begins, things start to pick up and the transition is seamless. Voice acting is pretty dull and straight from the beginning I could feel no emotion or energy in the lines that the characters were speaking, even when receiving instructions from headquarters, it sounded like saving the world was more like a minor thing. Battleship tries to go above the standard FPS by adding the turn style based gameplay with the use of Battleships. While to some extent this feels successful, the transition doesn’t always seem so smooth and instead makes the game look like its jumping around. Objectives have no purpose and feel rushed and overall I can’t see the vision that the developers were going for. Battleship is a game that tries new ideas, however they seem really unpolished.